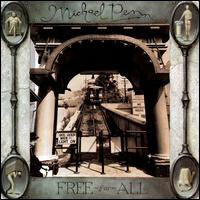 Michael Penn waited three years to release his next album, 1992’s Free-For-All, and safely avoided the sophomore slump. On the contrary, I rank this as his best album yet. Starting with the haunting acoustic ‘Long Way Down (Look What the Cat Drug In)’ and weaving through a string of metaphor-rich songs about love and loss, Free-For-All is a more potent and mature album than March. It’s also better produced, boasting an organic quality that’s lacking on his more polished debut.